Compassion: It is the feeling generated from our Moral Compass. It is the profound sense of our obligation to meet and exceed the expectations of our patients with kind caring and support for their needs and desires. Understanding: The vast knowledge in the field provides the insight to deal with each individual’s state of a personalized plan to improve one’s quality of life during the time of the sunset of one’s existence. Love: It is the ultimate sentiment of connecting at a personal level with another human being, who has trusted his or her life into our hands. We have created our organization with love for those who need it, as they go through challenging moments of health and loneliness. Trust: We come into your home as an extension of your family, and we earn your trust by fulfilling our promise, and preserve your dignity while improving daily the setting of your lifestyle. Unity: We are a team of dedicated professionals, who become one with you, your family members, your friends, and your medical providers. 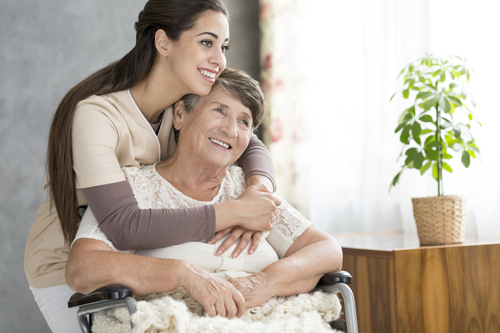 Collectively, we achieve the best care and services that you need. Respect: It is the foundation of our values, the required ingredient for anyone to show a real and honest approach to health care, with emphasis on the individual’s cultural, religious, ethnic, and personal views. This is our guiding principle to serve a higher cause. Excellence: Aristotle, the great Greek philosopher and teacher said, “ We are what we repeatedly do; excellence then, is not an act but a habit.” We, as a team, are not pleased unless you are completely satisfied. We strive for perfection, and we reach our goals of excellence. We do that through a careful process of selecting the most outstanding staff, who apart from their expertise in the field, they have a loving heart. For them, as well as for all of us, the care and services we provide are not reflected on a paycheck, but they are imprinted forever on our mind as a reminder that we have made a difference in someone’s life. Please give yourself or your loved one the opportunity to experience OUR CULTURE.